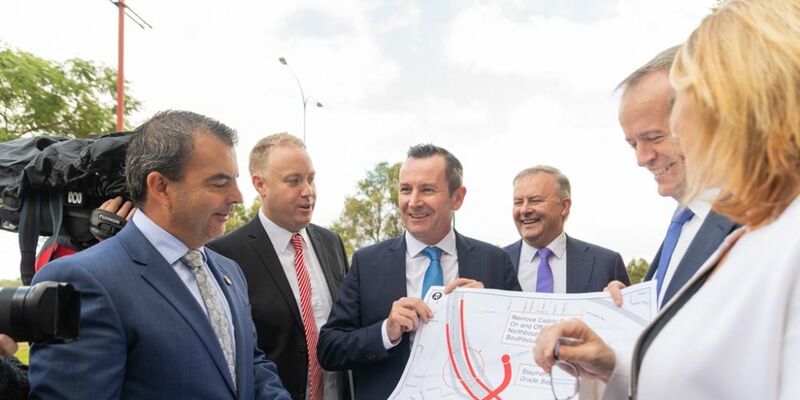 Stirling Mayor Mark Irwin, Balcatta MLA David Michael, Premier Mark McGowan, Federal Opposition infrastructure spokesman Anthony Albanese, Federal Opposition leader Bill Shorten and State Transport Minister Rita Saffioti look at plans for the Stephenson Avenue extension. FEDERAL Opposition Leader Bill Shorten has made a $64 million pledge to help transform the Stirling city centre. He announced the election commitment at Stirling Civic Gardens this morning flanked by Premier Mark McGowan and Stirling Mayor Mark Irwin. The State Government previously committed $60 million to stage one of the Stirling City Centre project, which involves construction of the Stephenson Avenue extension and new freeway interchange at an expected cost of $134 million. Cr Irwin welcomed the pledge and said the City had been trying to bring the project to fruition for more than 10 years. “This visionary project will transform the Stirling city centre into an accessible, vibrant urban centre, providing increased jobs and housing and connecting transport from the heart of the City through to the iconic tourism destination of Scarborough Beach,” he said. “Stage two of the Stirling city centre proposes a 7km stretch of light rail, connecting to the heavy rail at Glendalough Station and will run down Scarborough Beach Road right through to the redevelopment at Scarborough Beach. The city centre encompasses the Innaloo shopping centre precinct, Stirling station and the City’s administration centre. Mr Shorten said money would come from Labor’s $1.6 billion Fair Share for WA Fund that aimed to compensate for WA’s low GST share. “Anyone who knows the area of Stirling knows that this will unlock business potential, it’s already a key CBD hub outside of Perth central itself,” he said. Opposition infrastructure and transport spokesman Anthony Albanese said the commitment followed lobbying from Cr Irwin and City representatives. Mr Shorten criticised the lack of funding commitment from the Federal Government but Stirling MHR Michael Keenan said it would be premature to speculate on what infrastructure projects would receive funding given the budget was due to be handed down in several weeks. “However I have made strong representations regarding the Stephenson Avenue extension and the Stirling City Centre project more broadly to my federal ministerial colleagues over the past few years and am hopeful of what will be announced in coming weeks,” he said. Mr Keenan said the Government had delivered $715 million to WA infrastructure projects this financial year.